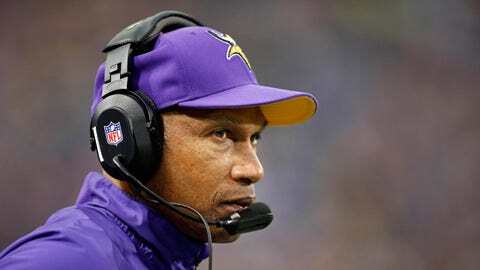 The Vikings are 20-32-1 under coach Leslie Frazier in three-plus seasons. EDEN PRAIRIE, Minn. — Leslie Frazier stood solemnly at a podium emblazoned with the Minnesota Vikings’ logo on Monday at Winter Park, trying to explain what happened in Sunday’s 42-14 loss at Cincinnati a day earlier. Frazier spoke about the third-down deficiencies and mistakes that led to four turnovers on the road against the playoff-bound Bengals. He did so in his usual calm approach, but with a noticeable somber undertone. Frazier, with Minnesota at 4-10-1, could be looking at his final days in front of the podium in Minnesota. With reports swirling about Frazier’s job status, the third-year Minnesota coach tries to focus on Sunday’s game at home against the Detroit Lions, the final game at the 31-year-old Metrodome and possibly the last for Frazier at the Vikings’ helm. "I think for our players, it’s important that they focus on the task," Frazier said. "That’s what I’m asking them to do, and I need to do the same thing. It’s very, very important if you want to have a chance to win these games down the stretch that I stay focused on what’s involved with leading our team and I want them to follow. It’s important I handle it the right way." Frazier has handled all the stress and distractions of being an NFL head coach with the consistent, composed demeanor for which he’s known. But Minnesota’s on-field performance hasn’t matched. The Vikings are 20-32-1 under Frazier in three-plus years. A second disappointing season sandwiched around a surprising playoff appearance last year has Frazier’s viability as the head coach under the microscope. Frazier said there have been no conversations with general manager Rick Spielman or the team’s owners about his job. Frazier has one year remaining on his contract after a little-known extension was exercised last offseason. Four straight wins to end last season put the Vikings in the playoffs, unexpectedly. Instead of a longer-term extension, Frazier was put on notice again with another make-or-break season ahead. Minnesota then lost seven of its first eight games this season. The momentum gained from winning two of the past three games was swept away Sunday with the blowout loss at Cincinnati. 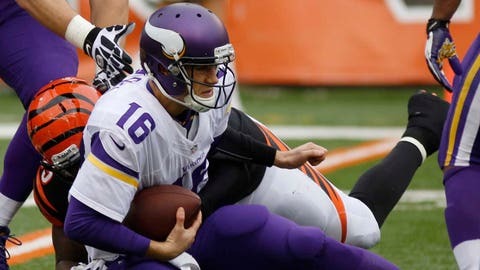 The Vikings were dominated on both sides of the ball and uncompetitive after the first quarter. A minus-3 in turnover-differential, 0 of 9 on third downs offensively, and 8 of 14 on third downs defensively were just the most glaring examples of a flat performance. "You’re not going to win very many games when you have that type of performance in those areas on the road," Frazier said. "It cost us dearly and it definitely made a difference in that ball game yesterday." Afterward, the players seemed to understand the status their coach is facing. MVP running back Adrian Peterson told reporters he would talk with management in support of Frazier. "He’s a special player, special guy," Frazier said of Peterson. Frazier and his players understand Sunday’s game is all they can focus on for now. No more talk about the missed opportunities this season, no use worrying about what happens after Sunday. "Well, for where we are, the most important thing is probably is try to focus on this final ballgame and do what we can to get a win at home," Frazier said. "That’s probably the most productive thing we could do as a team and as a staff; figure out a way to get our guys to go play this final game at home."